X is used to “mark the spot”, cross things out, and tell us when to multiply. But it’s rarely used in words that we speak. So, in this things that begin with x worksheet, I had to bend the rules a little bit. 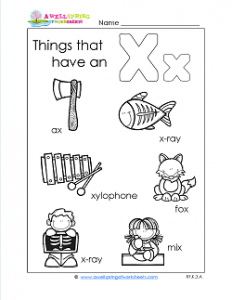 On this page you’ll find the same old things you usually find that start with x – xylophone, x-ray, and x-ray fish – as well as a few that have an x in them – mix, fox, and ax. All the other “things that begin with” worksheets have six items on them so I felt I had to be fair to little old x and have six for him, too. Be sure to sound out the words, circle only the beginning x, and color.